Hello! How are you doing everyone?! It's been awhile since I last posted here. Well, just became quite busy with the Christmas preparation but now I'm slowly getting back on track. Hope you had a wonderful Christmas celebration with your families, friends and relatives. I have this simple card to share with you which is patterned after the SC208 sketch challenge (and LSC200 as well) over SCS. I've been so way behind the challenges these past few weeks but at least, somehow I was able to make one even if I'm a bit late. My image is Sweet n' Sassy by Sugar Nellie which was given to me by Bec, I think almost 2mos ago now. I just made this card very simple so that the focus would be on the image. Isn't she lovely and sweet? I also used my new Fiskars embossing border punch (all a-fleur) which look lovely on this card as well. Thanks for looking and may you have a blessed New Year!! It is gorgeous Jhet and I love the way you coloured her.Enjoy your using your Prismacolors. What a great gift from hubby. All those pencils. I've had to buy mine one at a time. LOL. I love how you coloured her in. Your card is really lovely. It's absolutely gorgeous!! Well done! Happy New Year! Great job colouring! I just love using Prismas. I really like this one Jhet!!! 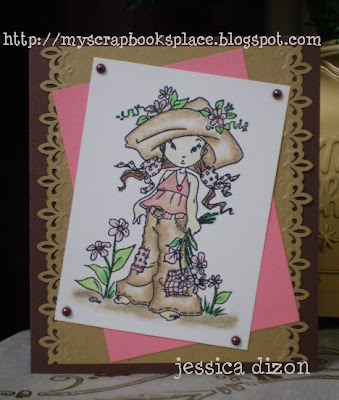 It is absolutely gorgeously coloured and I love how you've used the border and the layout! Fabulous!